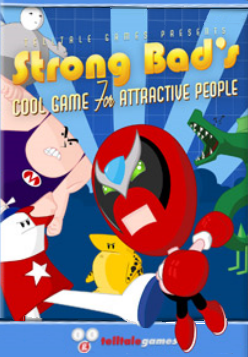 Strong Bad's Cool Game for Attractive People is Telltale's third episodic series, after Bone and Sam & Max. This is the first of Telltale's episodic series that was released on a video game console, namely the Wii through Nintendo's Wiiware download service. Since it was developed with Wiiware in mind from the beginning, it was designed around the benefits and restrictions of Wii and the Wiiware service. Wiiware has a maximum file size limit, so each episode has simple backgrounds and character designs. Since this is an adaptation of the popular flash cartoon series, Homestar Runner, those restrictions were not a problem with the source material. The games really do capture the look of the cartoon series. The game is also the first Telltale game to include some elements of gameplay console players expect. Telltale dabbled in unlockables before, with the COPS car chase minigames in Sam & Max Season Two, and the thoroughness points and bug hunts in CSI: Hard Evidence. But, here Telltale refines their past endevours and adds new things. The thouroughness points are now points on Strong Bad's "awesome meter", the hunting of items is possible through using a metal detector and a shovel, and the minigames are more extravagent than ever before. Each episode contains a minigame that can be played through Strong Bad's fun machine, that emulates the look and feel of a classic console, and usually spoofs classic games of that era. After a brief delay from an advertised date of June 2008 to August 2008, the games were released monthly until December 2008. They were released on the North American Wiiware service and on PC through Telltale's website on the same day. The games were released on the European Wiiware service at a later date, and did not keep the same monthly release schedule as the North American releases. Strong Bad attempts to compete in the tri-annual Race to the End of the Race, then kicks out an unwanted house guest. The King of Town's e-mail tax makes Strong Bad unite rebel factions under the Strong Badian flag to end tyranny. Strong Bad's Fun Machine breaks. Strong Bad decides to get the money by starting and winning a Battle of the Bands. Strong Bad's long-awaited third movie in the buddy cop series is finally made, starring most of Free Country USA. Characters from classic video games are entering the real world. Strong Bad must find a way to put them back.